Yes., i's true. In the near future you will be able to own action figures of Walter White, his alternate meth kingpin ego Heisenberg, Jesse Pinkman, and god knows who else, thanks to the delightful lunatics at Mezco Toys. And that's not all - Mezco will be doing other collectibles for the AMC series including mini-figures, bobbleheads, paperweights, plush toys, and more. YOU MAY BE ABLE TO PURCHASE A WALTER WHITE PLUSH TOY IN 2013, PEOPLE. That's madness. 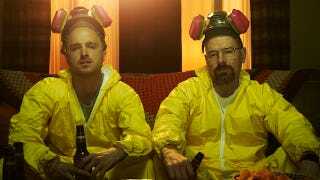 What I'm hoping for, though, is an RV meth lab playset, so Walter and Jesse can cook up meth for all my other toys. If you're telling me my Masters of the Universe action figures Mekanek, Stinkor and Snout Spout wouldn't immediately become insane meth addicts if the opportunity were available to them, well, then, you don't know Mekanek, Stinkor and Snout Spout like I do, my friend.